On a comedy program, “People who look for laugh”, one woman wants her boyfriend to buy her some macarons, while she is not even thinking of giving any present for her boyfriend’s birthday. This woman is a character that appeared in a Korean show, but has also been generalized as one type of Korean women. Because of her selfish behavior, three men, who are around the couple, side with the boyfriend and make her angry by making fun of her, saying, “Men have to stick together and help each other.” This is one of the popular comedy program’s corners, called “Between Man and Man.” It satirizes a conflict, one that gets especially heated, at times bordering on hatred, between men and women in the broader society. With the development of the Internet, people are able to express their opinions about specific issues more easily than before, where anonymity allows emotional arguments with more direct and provocative comments compared to face to face discussion in real life. Because of this, there are also serious conflicts arising between females and males as a result of incendiary comments on the Internet. 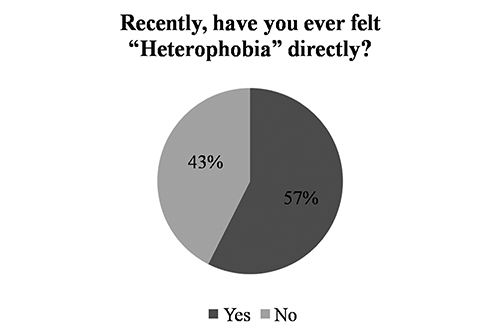 Heterophobia is not a suddenly-emerged phenomenon. It is the modern result of two older ideas. “Misogyny” refers to the hatred or dislike toward women. The word “Misogyny” can be found occasionally in ancient mythology texts. Also, various influential Western philosophers such as Aristole and Antipater of Tarsus have been described as misogynistic by despising women. On the other hand, “Misandry” means the hatred or dislike of men or boys, which appeared in the 19th century as a parallel form to “Misogyny.” The term “Misandrist” was first used in an English magazine, The Spectator, in April 1871. In the article, “The Illustrated Natural History, Reptiles, Fishes, Molluscs, &C” written by John George Wood. Although hatred between men and women has existed from the past, as various cyber communities on the Internet have developed, the extent of the hatred is getting worse. Anyone can encounter the atmosphere of hatred directly on the diverse communities on the Internet. On a cyber community called “Ilganbest Jeojangso (Daily Best Storage)” community, also known as “Ilbe,” several users tend to write defaming comments on women with sexually offensive words a lot in every bulletin board. In addition, they create new words that belittle women such as “Sam-ill-han,” meaning man should hit woman once every three days and “Kimchi-nyeo” referring to some Korean women who tend to rely on men financially. The comments and writings made by Ilbe users brought about a public backlash over their malicious overgeneralization of the negative sides of women. Another women-focused community is “Magalian” that is a compound word of MERS and a novel Egalia’s Daughters. Users of the community argue that Magalian is not a community of misandry, but it is for hatred of something misogynistic, which is the effect of “mirroring.” They explained that through this strategy, they transform the “Misogyny” terms into the “Misandry” terms, just like light reflects from the mirror, in order to show the males how it is like to live as a female in Korean society, hearing those disparaging terms from the men. They want the males to realize that those women-disparaging terms are violent and abusive by making them feel the same way. For example, in response to the Ilbe’s term “Sam-ill-han,” meaning that men should hit women once in three days, Megalian introduced a new term called “Soom-shil-han,” meaning that women should hit men every moment when they breathe. In the past, there was a tradition regarding the men as more superior beings than women, called male chauvinism, which still remains in the current society. However, with the expansion of gender equality and women’s social participation, men have started to feel greater sense of crisis. Professor Jo explained that this is becasue as men began to compete with women more intensely, they have become to shift their economic anxiety to women who are the minority (Sociologically, a minority group is defined based on how much they experience socio-economic inequality, not on the proportion of the group). 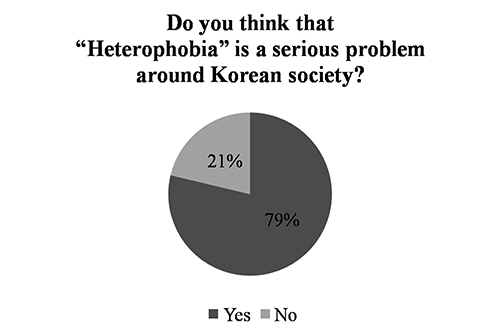 The solutions of the heterophobia phenomenon can be deducted through thinking about its causes carefully. First, the competitive atmosphere in the social structure should be alleviated. Professor Jo said, “According to the result of sociological research, the biases and discrimination towards the opponent group disappear if the competition between groups disappears. However, regarding the fact that people are currently under global trends of neo-liberalism, reorganization of industrial structures, and changes in the demographic characteristics, it seems fairly difficult to implement a coherent policy that can solve this problem.” In other words, such solution is something that should be pursued with a long term view. Second, gender equality should be more expanded. Gender discrimination has always been a serious issue due to traditional male-dominated culture in Korea. The process of rapidly implementing gender equality in our society has led to the resistance by some male groups with vested rights, and this is considered to be the mentality that ultimately changed into heterophobia during recent times. Third, which is a more short-term solution, more active communication between the genders should be promoted. Instead of only looking at the negative sides of the other gender, efforts to see the positive sides are needed, with a more open-minded and cultural relativism-oriented attitude. This solution has a thread of connection with the present situation as the gender ratio is lopsided on the Internet communities such as Ilbe and Women’s Generation, which hinders them to have logical and rational discussion. For instance, Women’s Generation only allows females to join the community. Also, according to a survey done in 2013 by Ranky.com, which is an online research site, 75.8 percent of the whole visitors of “Ilbe” was male.